Important: I have enabled Global background color, but I have not enabled Global foreground color. One very strange thing that is still baffling me though: My old theme file doesn’t have a language defined for JSON files, but the stylers.xml does. So json files weren’t showing up in my list of languages. I copied the json section over to my custom theme file, restarted NPP, but json still doesn’t show up. I went into Settings -> Preferences -> Languages and nothing I did in there had any effect at all. By best result was to copy my .js section from my custom theme back to stylers, and that works, and it works for json also. It seems like NPP really has some bugs in this regard. Things the UI clearly indicate can be customized actually does nothing in several respects. Am I doing something wrong? 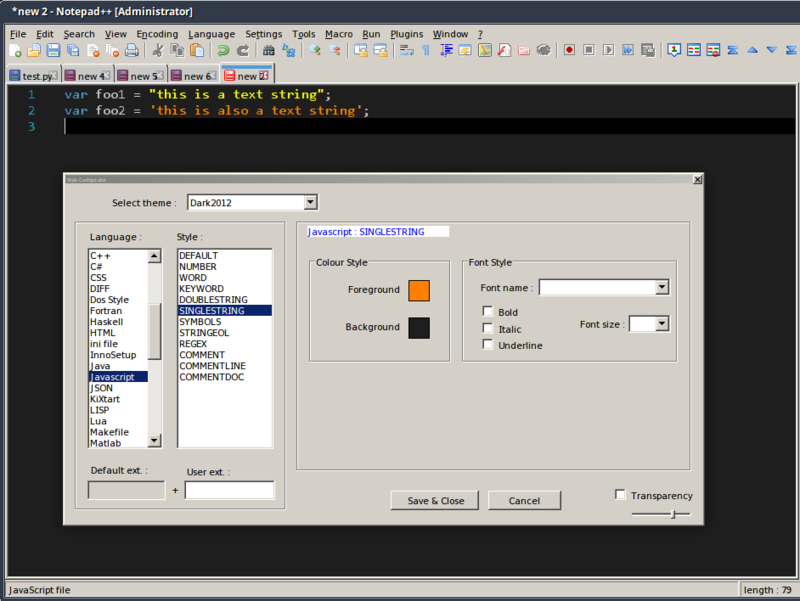 Concerning the changes - I guess the reference is the default theme (styler.xml). entries for the language in question, as well. If this is the case, than it should work. From the current discussion I get the feeling that your styler.xml is already corrupted. which is used to create the styler.xml if you do a new installation. Of course, you can also run a compare of these files and do the changes manually.